Get a high-quality print or poster of this image! This image was selected as NASA's May 21, 2009 Astronomy Picture of the Day. 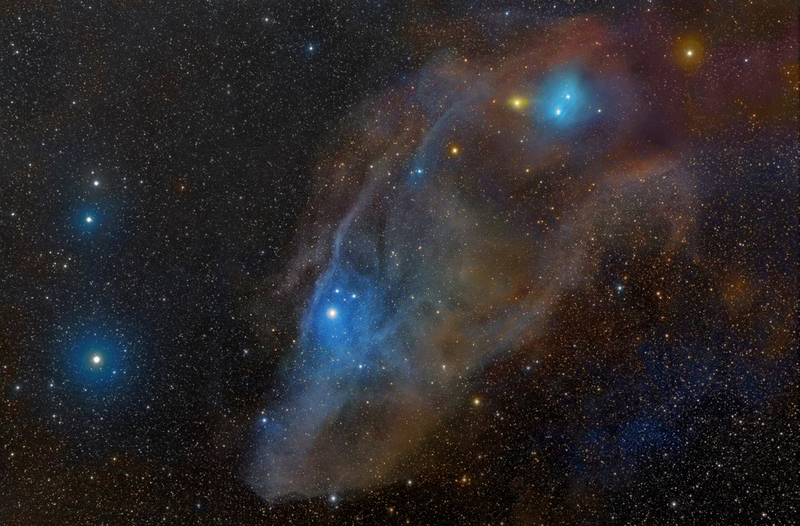 IC 4592 is a reflection nebula in Scorpius, sometimes named "the blue horsehead", that surprisingly is not photographed very often, as it's a beautiful and colorful object. It's also very large (relative to us), especially compared to it's cousin, the most popular Horsehead in Orion. I have to credit my wife Ariana for being the one who came up with the framing of this object. I'm very happy she's the one who came up with it - I can't think of a better way to frame the "blue horsehead". Thanks Ariana! As for the session, it was a very warm night at the DARC Observatory (average 70F), which forced me to cool the STL at "only" -5C. Despite I'm fighting a problem with the focal reducer, this image didn't turn out too bad. I was originally planning to add more RGB subs to get more accurate colors - yes the image is super colorful but the color data wasn't very detailed. In the end I decided to leave it as it is, and perhaps revisit this object next year.